TI's OPAx365 seems to be a fairly ordinary op-amp after you dig through all the marketing buzzwords. But one thing sticks out: the datasheet repeatedly mentions having a "zerø-crossover" topology. I initially thought the use of ø instead of o was a typo, but it doesn't seem to be as the term is used, including the ø, repeatedly throughout the datasheet. Is this some form of branding for their proprietary technology, or is there some actual reason for this spelling? In many rail-rail input CMOS op-amps, 2 pairs of input differential pairs (NMOS/PMOS) are employed to achieve a rail-rail input common-mode range. 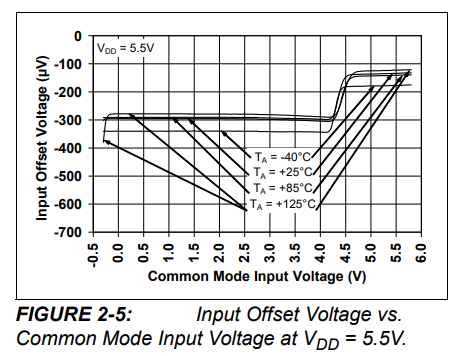 The drawback of this solution is that, each diff pair NMOS/PMOS has its own unique input offset voltage. So transitioning between using the NMOS to PMOS input differential pair results in cross-over distortion (variation of input offset voltage). Of course you can design your amplifier in an inverting topology and the common-mode bias remains essentially constant. In that case you wouldn't suffer this form of cross-over distortion. EDIT: Why the null symbol? If I had give an honest guess, it would be TI trying to secure a trademark. But, It is more than likely the design staff being clever. In the opamp world, the act of removing the input offset voltage is referred to as nulling the amplifier. You can look all the way back to the 741, to find null terminals to allow the amplifier to be nulled in circuit. The use of the null symbol ø versus the letter o, would be a clever play on this terminology. Taken from the MCP600X datasheet. TI is not the only manufacturer with opamps that increase their common-mode range with a charge pump. What makes the OPA365 proprietary is the low-ripple charge pump (TI has patents on that, and uses apparently similar technology in the TPS6024x chips). TI does not say how much this improves the opamp, or if this technology is just a more efficient way to get the same ripple. So for practical purposes, you can treat the ø symbol as a marketing affectation. Not the answer you're looking for? Browse other questions tagged operational-amplifier datasheet or ask your own question. What does NOM stand for in a datasheet and what does it mean? 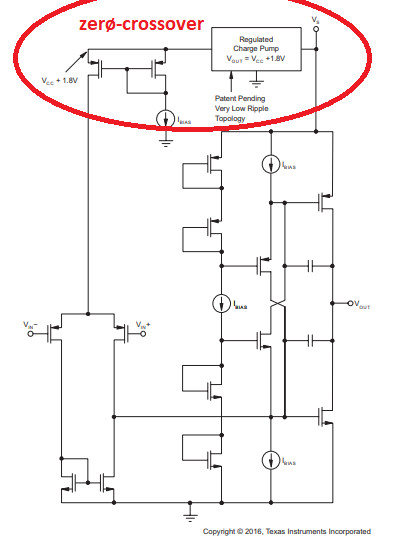 What does the bar above a pin name in a datasheet mean?